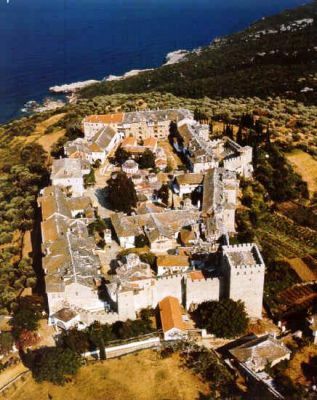 The Monastery of Great Lavra is the first monastery built on Mount Athos. It is located on the southeastern foot of the Mount at an elevation of 160 metres. The founding of the monastery in AD 963 by Athanasius the Athonite marks the beginning of the organized monastic life at Mount Athos. At the location of the monastery, there was one of the ancient cities of the Athos peninsula, perhaps Akrothooi, from which the sarcophaguses of the monastery that are in the oil storage house come from. The history of the monastery is the most complete in comparison with the history of the other monasteries, because its historical archives were preserved almost intact. It is possible that the study of these archives may contribute to the completion of the knowledge of the history of other monasteries, whose archives were partially or all of them lost. The most important of all the other chapels are these of Saint George, Saint Athanasios and of Virgin Koukouzelissa. The Phiale, the basin for the blessing of the waters stands outside the main entrance of the Katholikon. It is the oldest and the biggest in Athos. Just opposite the entrance of the Katholikon is the refectory, frescoed by Cretan painters. The library of the monastery is located behind the main church. It contains 2,116 Greek manuscripts and 165 codeces. Among them uncial manuscripts of the New Testament: Codex Coislinianus, Codex Athous Lavrentis, Uncial 049, and Uncial 0167. There are also over 20,000 printed books, and about 100 manuscripts in other languages. The collection is one of the richest collections of Greek manuscripts in the world. The vestry is behind the main church. Some of the most important artifacts are a manuscript of a gospel with a golden cover which is a gift from Nikephoros II Phokas and the list (Kouvaras) of the monks since Athanasius. There are also 2,500 icons which cover the whole history of hagiography of the second millennium. 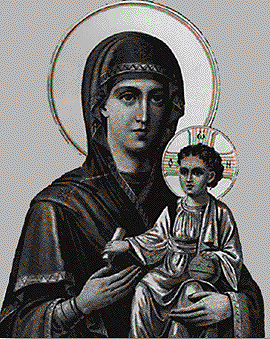 Virgin Koukouzelissa is a XII century icon. Unfortunately this icon was not preserved in a good condition. According to monastery’s myth the main chorister of the monastery John Koukouzellis, the Great Master of Byzantine church music fell asleep in his armchair. In his sleep Holy Mary attended him and greeted with the words “Sing for me and I’ll never abandon you”. She gave him a golden coin which he found in his hand when he woke up. This coin was applied to the icon but subsequently was lost in the XII century.